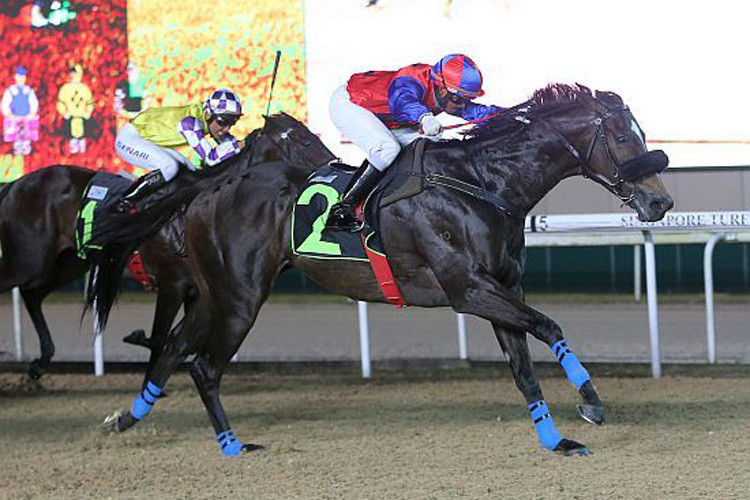 Honest sprinter Autumn Rush swelled his win account by another one when he rallied under a new partner to take out the $85,000 Kranji Stakes B race over 1200m on Friday night. At the winner’s circle, trainer Steven Burridge was effusive in his praise of the Keano six-year-old as a model of consistency any trainer would love to have in their barns. 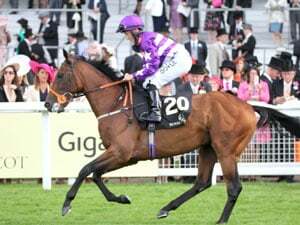 Ridden for the first time by Ricardo Le Grange’s Malaysian apprentice jockey Krisna Thangamani, Autumn Rush relished the return to his pet surface, the Polytrack, with a handy run throughout, but to be fair, his task was also made easier from the misfortunes of others in the race. At the 750m as they started to pack up behind favourite and race-leader Special King (Nooresh Juglall), Dance In The Wind (Marc Lerner) suddenly went amiss, dragging the Daniel Meagher pair of Webster (Chin Chee Seng) and Invincible Ryker (Benny Woodworth) to the outskirts of the track. Upfront, Autumn Rush needed no second invitation to charge head-down towards the winning post as the battlefield suddenly became a lot roomier, with two major threats virtually put out of the race. One of them, however, recovered from the forced detour. Regaining his equilibrium, Webster rapidly worked his way back into the race to cut the margin back on Autumn Rush while Viviano (Noh Senari) was also chiming in on the inside. It was to little avail, though, as Autumn Rush just grows another leg on the all-weather. Well ridden by Krisna, he knuckled down to the task to land the spoils by one length from Webster with Viviano third another three-quarter length away. The winning time was 1min 11.92secs for the 1200m on the Polytrack. 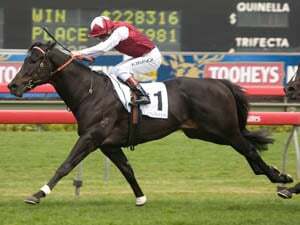 “It’s good for (son) Wade as he bought this horse and syndicated him out (to the EZ Stable),” said Burridge. 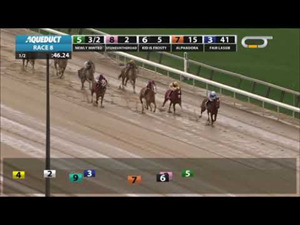 “With four seconds and three thirds, he has been ultra-consistent and he loves the Polytrack. I’m glad to see him win another one for the owners. “The kid rode him well. He was not too excited, I think the owners were more excited than him! From his six wins, three came under the guidance of Burridge’s apprentice jockey Simon Kok Wei Hoong, who is currently riding in Tasmania and won’t be back until March. In his absence, Burridge handed the reins to Noh Senari twice this year, but with the in-form jockey opting for the Mark Walker-trained Viviano on Friday, he was happy to put the under-utilised Krisna on. “Autumn Rush is a horse who races near the lead, and it’s always nice to get a bit of relief off his back. That’s why I like to put apprentices on him, and in general,” said the Australian handler. Krisna, who does not ride often for Burridge, was only too pleased to oblige when the call-up came. He said he sat on Autumn Rush for the first time in the race itself, but the perfect parade ring instructions coupled with a good dose of luck in the running kept his good 2019 run going. “This is my third winner (after Einstein’s Cross and Jumpin Jack, both for Le Grange) for the year. It’s good for me,” said Krisna who was formerly based in Kuala Lumpur with trainer Richard Lines before he crossed the Causeway in July 2017. “I’ve never ridden this horse before, but I know he’s a good Polytrack horse. I just listened to the trainer’s instructions which were to use his good gate to follow close to the speed. “I got a lot of luck when they all went out wide and I was left alone. I could see Benny’s horse going out wide. 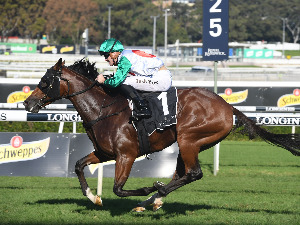 Autumn Rush continues to be a handy moneyspinner for connections having now taken his prizemoney close to the $370,000 mark.